Ginetta G33 designer Mark Walklett's Ferrari in the Free Ads. Mrs Spadge likes this car so it is indeed a rare beast and do remember a Ferrari is a red car with a horse. "Dear Spadge, Julian and I took first in class at the California Autumn Classic in San Juan Bautista yesterday. Our class included a Daimler Dart and a late series big Healey. Everyone just loved the car. Note that in contrast to the prizes you win, we won ours sitting still! We used the hood for the first time, carrying it with our luggage in the boot on Saturday but putting it on overnight and showing the car with it on due to showers (the first since May) on the Sunday and heavy rain on the drive home. We got 32 miles per gallon (US) for the 130 mile roundtrip and the 85 mile back roads tour on Saturday. Dan"
In August the G4 was at the Pacific Grove Show and Rally. Dave and Nina Baker's Ginetta G21 competing on the hills of Scotland last weekend following re-commissioning and engine work here. 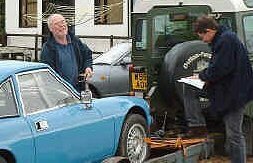 Last week Richard Branson (no, not that one) collected his Ginetta G15 that he bought so quickly we didn't have time to put it on here. Spadge awarded him The Worst Trailer of the Year Award (no, not the "He was a man. She was a woman. This time it was personal." type trailer and yes the award is awarded yearly on a year by year basis). Richard thought this rather unfair as he had only borrowed the trailer. Dan and son recently drove their Ginetta G4 to Monterey where it received much acclaim at the Pacific Grove Show and Rally. Freelance Damian Malone journalist working for Practical Performance Car magazine wants to feature the yellow V8 Imp we had for sale in the Free Ads for quite some time. If you can help Damian contact him on 07802 685146. Paul Tapner is now on the second set of new tyres bought this trip in his Ginetta G33 . The last set took 5000 miles to wear out and his trip mileage is 11,000 .. all with the top down! Paul, get back to the office, drink more in the evenings, take up war gaming or macramé, book in for a service something must be about to fall off! When we delivered The G12P project to Roger Williams in Scotland last year, his wife was muttering that they had some lovely projects in the garage but no curtains in the house. This amused us greatly. This week we received an encouraging progress report from Roger and the email was titled "Still no curtains". We've been working on a very nice Gilbern Invader Mk3 for Ian Burrows. It is a lovely car which sounds great and is a practical and comfy four-seater. Doesn't handle like a Ginetta though! We were very sad to learn from David Grunberg that his immaculate Ginetta G4 was involved in an horrific accident recently. The great news is that he walked away from a car with virtually no bodywork left, without a scratch. This is testament to the design of the chassis and the ability of fibreglass to absorb impact, albeit with rather messy results. 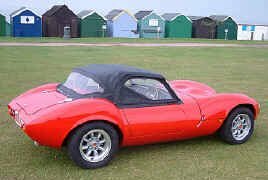 The Ginetta G10 that he has bought and we are preparing for him is in the workshop gaining new trim, paint and a few other bits and pieces.